At the beginning of December 2017, Round Oak School saw the unveiling of a colourful, new piece of art work in the school’s entrance hall. It was made by over 100 pupils working with textile artist Jacqui Smithson. 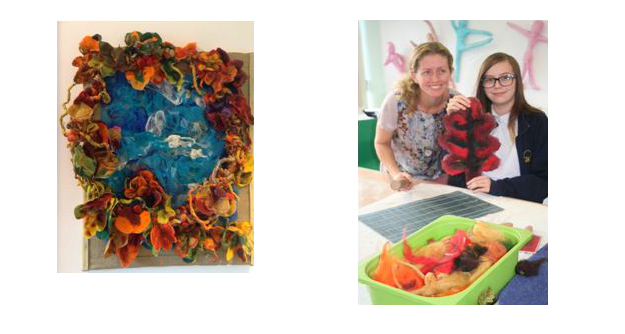 Jacqui worked with groups of children over four days, teaching them about the history of felt and how to make it using Merino wool, silks and threads. 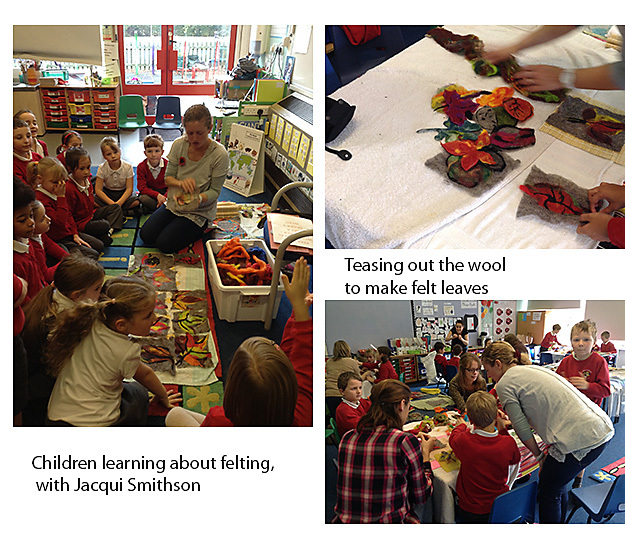 Inspired by the environment around them and by the name of the school, the felt was formed into leaves, acorns and twigs. This project was particularly appropriate for the pupils who have learning difficulties ranging from moderate to severe. They were encouraged to talk about the materials as they enjoyed the tactile experience. We were very fortunate that we were able to obtain a grant from the Patricia Fay Memorial Fund towards the project, the balance being met by our Society. 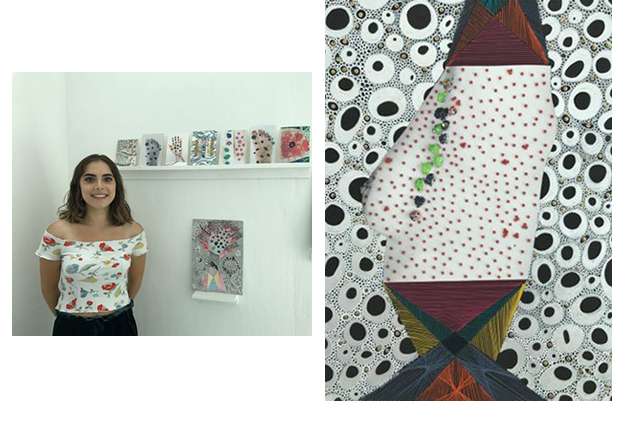 We were very pleased to award The Arts’ Society, Royal Leamington Spa Bursary Award for 2017 to Romany Cavalla. This is an annual award that is given to the best student at Warwickshire College. Romany impressed us and her tutors at the college; she was a very dedicated and hard-working student. Romany based much of her work on the human body. She is now studying fine art at Brighton. As previously mentioned, Rosie Taylor, a Year 13 ‘A’- level student (2016) from North Leamington School was a finalist in the ‘Make your Mark’ competition. This was organised by the West Midlands Area to coincide with the national AGM which was held in Birmingham in May 2017. All the work of the finalists was of a very high standard. 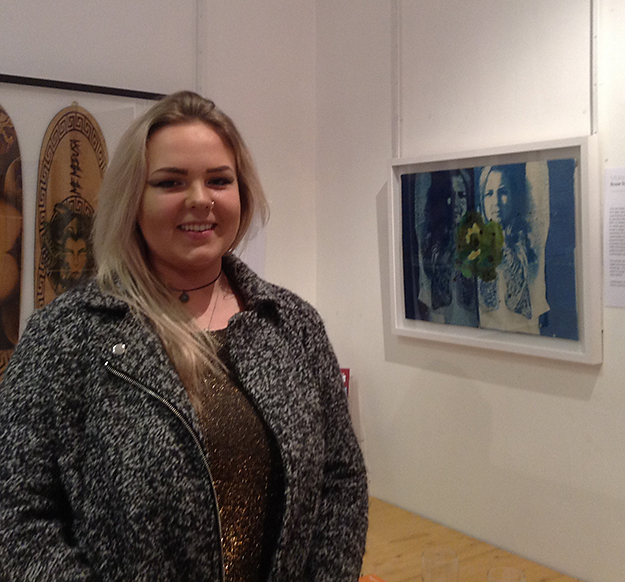 We were therefore very pleased that Rosie was awarded 3rd prize. The Playbox theatre in Warwick is even older than The Arts Society in Leamington! It was started 31 years ago by a young mother, Mary King, who wanted to encourage and develop children’s imagination by providing creative programmes. What began as a small venture in one room has developed into a programme of workshops for all ages across the region. Some of the performers have gone on to perform with the RSC in Stratford and London. We support Playbox Theatre by giving an annual donation towards its work. As members we can support it by going to see the productions that are staged regularly during the year. In December some members went to see ‘The Wizard of Oz’. It was an excellent production which showcased the talents of the young actors that attend Playbox. Read about its history at www.playboxtheatre.com It is a fascinating read about the development of the theatre and one person’s vision. All the children took turns to work with a mixed media artist, Jacqui Smithson, using coloured merino wool to make leaf designs and trees. These will eventually be put together to form a colourful display in the school’s entrance hall. The children were very focused and obviously enjoyed the experience. Our society supported this project which involved more than 500 primary aged children from Leamington Spa meeting together to link by Skype with the school in Bo, Sierra Leone. The funding provided art materials for work inspired by a Sierra Leonean artist. The children also learned about the culture through music, songs and traditional stories from Sierra Leone. We were pleased to provide funds to help support a concert given by the newly formed CWYO. This new organisation merged three previous youth orchestras and is now providing high quality musical experiences for players and audiences.